Midrash is a kind of story-telling, created by the ancient rabbis, to fill in the gaps in the Biblical narrative. These stories are sometimes wildly inventive; the rabbis make use of the oddities in the Hebrew grammar, transforming them into hooks for nuanced theological points. The midrashic literature is a form of serious play, something like a jazz riff. There are several different kinds of Midrashim (= plural of Midrash); the best known are those that use a metaphor to explain the Biblical story. One of the most famous formulas is to say “this is like a king who had a son…” or “this is like a king who had a daughter…” – in these stories, God is the king and the son or daughter is the people Israel. Resh Lakish, by the way, was a bandit who left his gang to study Torah – he’s one of the sources that I quoted in my High Holiday sermons. Resh Lakish’s comments regularly demonstrate a keen eye for these kinds of injustices. He seems to be aware that God or nature or Providence – whatever you might want to call it – does not always deal a fair hand to every creature. It’s an interesting point to ponder. This midrash does not arise in a vacuum, however. It is a response to a very particular problem in the text. The rabbis have noticed that the Noah story has a series of redundancies in it. For example: How many animals went into the ark? How many days did it rain? What kind of bird did Noah release? Some Biblical scholars believe that the Noah story may be two separate stories stitched together from two different sources. In fact, in one of the exercises in Rabbinical school in our second-year Bible class, we were asked to use two different colors of highlighter to identify the two different stories regarding Noah. It is something you can try at home. The ancient rabbis, of course, were very aware of this aspect of the text, but they were committed to the reading strategy that sees the whole text – even these composite stories – as part of a larger revelation from God, one that is perfect in its own way. That is to say, if the text has contradictions in it, or seems to be an amalgam of two sources, it must be trying to tell us something. This doubling must have meaning. ‘The prince of heat’ and ‘the prince of cold’ are references to the angels in control of the weather. The raven has a point: Noah is the one who makes the decision to send a raven – it is not a decision attributed to God by the text. Noah sends one of the pair of unclean birds rather than one of the seven pairs of clean birds. Noah has no extra ravens to spare, and could accidentally cause the extinction of a species by his choice. Let’s stop there for a moment and consider what has been said so far. These ideas may seem far-fetched for you. For one thing, where in the Bible does it suggest that the gates of the garden of Eden were ever opened for any creature? Are they not making things up when they write this material? As I said earlier, the ancient rabbis make a series of assumptions about the text: this text is meaningful – all of it – and this text is the revelation of God. Nonetheless, the text’s deeper meaning is not always obvious to us. There is a possibility that we may have to interpret it. As the rabbis will remark at times, “this text says ‘interpret me!’” – they are aware of the problems and difficulties of the text. They are aware of the repetitions and the contradictions. They are committed to uncovering its meaning, but they are not committed to a process that relies on objective historical research. The rabbis are responding to the reality that an olive leaf is an odd choice for the dove to pick. Olives are bitter fruit, which is why we brine them. Think of that astringent olive taste: the leaves must also taste bitter, like the unbrined fruit. There is a reason why we never eat olives raw! The olive tree, however, provided the oil for the lamps in the Temple. In this reading, the olive is an allusion to the sacrificial system that would one day be instituted in the Temple in Jerusalem. In this context, then, it should not surprise you to find out that the dove also is often a symbol for Israel in the rabbinic literature. What does this text mean, then? The rabbis were aware that the life of the Jews may be exceedingly difficult at times. But here they are framing it as a choice: we would rather partake of the blessings of God (even if they are bitter at times) than the blessings of humanity (even if they are much sweeter). Unlike the raven that is content to scavenge, the dove seeks out the higher reality behind the everyday search for food and shelter. What about the gentle reminder that the dove gives to Noah? What does that mean? Noah represents the righteous people of the world. The dove (that is to say, the people Israel) is aware that there is more to life than mere righteousness, praiseworthy though it may be. We are also called to serve God. In this regard, the Midrash is referencing other Midrashim: Noah was righteous in his generation, according to the Biblical text – but would not have been righteous in another generation, according to some Midrashim. How so? When told that the whole world would be destroyed, Noah built an ark for his family. In contrast: when told that the cities of Sodom and Gemorrah would be destroyed, Abraham argued with God, suggesting that God should not destroy the righteous and wicked alike. It is righteous to take care of your family; it is godly to take care of others as well. What are we to take from this text, then, for our own lives? It takes all kinds of courage and character to follow the voice of God in our lives. It can be very difficult. But above all else, know this: we are defined by the choices we make in our lives. Are you Noah, the raven, or the dove? Hayim Nahman Bialik and Yehoshua Hana Ravnitzky, The Book of Legends: Sefer Ha-Aggadah, Legends from the Talmud and Midrash, William G. Braude, transl. (New York: Schocken Books, 1992), p. 28. What is the meaning of the story of Adam and Eve? My rabbi, Allen Krause, z”l, read it as a narrative about the human condition. When we are children, we live in Eden: all of our needs are met and we have no need to till the soil. Eventually, we grow up and become parents and have to work for a living. Eventually, we become knowledgeable in the ways of the world. Eventually, we have to leave Eden to know what it means to feel pain. It is not simply a cautionary tale, however: the process of growing up also means gaining knowledge. When we eat from the tree of good and evil – when we gain that knowledge – we become aware of our ability to affect the world around us. We learn how to take responsibility for our lives. For us, therefore, the Adam and Eve narrative is an acknowledgement that growth involves some pain and rupture. We have to leave behind what is comfortable and familiar to venture into a new realm, one that is profoundly unfamiliar. At times, it seems that the land itself is resistant to our efforts: The soil is rocky, the task is difficult, and the yield is poor. But this growth is also what allows us one of the greatest joys: that of nurturing new life. But is that the only way that the story could be understood? 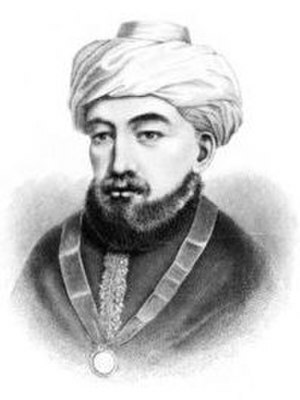 Maimonides provides us with a second interpretation. In Maimonides’ view, Adam and Eve were in the Garden of Eden basking in the glory of God. This ‘glory’ is considered to be a form of energy, like a golden light, that overflows from God and animates all things. This energy, known as the Active Intellect, is also the source of wisdom. When Adam ate from the tree of knowledge of good and evil, it meant that he shifted his attention away from God’s glory to the world around him. Adam’s turn away from God to consider the lesser subjects of good and evil was the reason why he lost his immortality. Whereas he had been contemplating pure truth, he was now thinking about mundane things – what is good and what is bad. What is particularly interesting to note here is that good and evil are not considered to be absolutes, according to Maimonides; instead, they are relative terms that relate to social conventions regarding the regulation of the appetites of the body. That is not to say that Maimonides believes in relativism. For him, truth and falsehood are absolutes. But ideas regarding what is good and what is evil are related to social conventions. It is a strikingly post-modern formulation for someone who wrote in the 12th century. Even though Adam turned away from truth, we can still perceive it. Even as mortals, humans are still sometimes able to turn back to God in isolated moments. To put that in more modern language: we are sinful when we follow our bodies’ desires but we are righteous when we follow our minds’ analysis. In the act of thinking, we have the ability to rise above ourselves. What is another possible interpretation of this text? For the mystics of Lurianic Kabbalism, the Adam and Eve story is an explanation of how evil entered into the world. First, God created the holy light. That’s what’s meant by ‘God said, ‘let there be light’ – and there was light.’ After the creation of the light, then God then created vessels to hold that light. But when the light poured into the vessels, they shattered. The story, therefore, is read as an allegory by the Kabbalists: it describes the processes within God that unfolded during creation. In their view, our role is to redeem those scattered rays of primordial light. We do so by performing the commandments with pure intentionality. Later, the Hasidic movement added to this Kabbalistic textual inheritance, and provided additional insights as to how these texts might be applied to our own lives. It offers quite a lot of wonderful material. Over this past year, I have been reading Hasidic texts with a hevruta, a study partner, as part of my work as a fellow in the second clergy cohort of the Institute for Jewish Spirituality. In this coming week, we will study a text from Rabbi Kalonymus Kalman Halevi Epstein of Cracow. According to the text, our task as Jews is to repair the original orderliness of creation, the one that existed prior to the first sin. Our job is to release all of the sparks, the ones that fell into inanimate matter, plants, animals and human beings. I found two things that are interesting here: the first is the idea that at every level we are able to help repair the world. Even when we are doing our regular work, we are able to have an impact on the larger project of perfecting the world. I find that particularly encouraging. If you do a good job, even when doing a mundane thing, that work can affect the people around you for the better. Are you cheerful? Are you helpful? Are you kind? These things matter. Regardless of whether your role in the world is large or small, you can be a force for good. The second thing I found interesting here: according to the text, even your mistakes can be helpful to others. In fact, mistakes are how the sparks within human beings are released. Why is that? If you should repent for what you did – even if it is a small thing – and then say that you are sorry, your example can influence others to do the same. You release the misdeeds of others by modeling this behavior. This lesson demonstrates why pursuing integrity in all our deeds really matters: how each of us respond to others can be a source of inspiration – or a source of pain. You are the one who decides. You can always choose to be kind. (1) Maimonides, Guide, III:8, vol. 2, p. 431. In Frost’s poem, the choice “that has made all the difference” is between two remarkably similar paths with minor variations. This poem has become axiomatic in our culture, as a reminder that small decisions can have far-reaching consequences. One only needs to quote a line to make that point. It’s a pleasing poem, one that reflects a quietly self-satisfied kind of life. That situation, however, is not what’s facing Joseph right now. Rather, our weekly portion opens with a dramatic moment in Joseph’s life: his brothers have returned to Egypt, and his half-brother Judah has just come forward to argue on behalf of his full-brother Benjamin’s life. And Joseph must now choose how to respond. One can imagine what he is thinking as he listens to Judah’s plea: These are the brothers who sold him into slavery; these are the brothers who have arrived in Egypt starving and penniless; these are the brothers who do not recognize him in his Egyptian dress, outfitted as the second only to Pharaoh. What would his life look like if his brothers had not sold him into slavery? And it brings up for us an important question: What happens when the defining feature of your life is trauma of this intensity? How can you venture a definition of your life and your self, when this kind of abuse is the dominant feature? That event, after all, is a touchstone for every aspect of Joseph’s personality and character. For better or for worse, it is the central defining moment of his life. Any personal narrative that he constructs to explain himself to himself and to others must try to make sense of this trauma. Those who have been marked by this kind of intense pain will understand: he will always be the kid who was sold into slavery by his brothers. It has, in a literal sense, become part of his DNA. Ever after, he will always be just a little bit intense; it’s the scar that this kind of trauma leaves behind. So his brothers are standing in front of him, the ones who caused him such pain, and he needs to decide what to do. How to respond? Is it ever really possible to forgive and forget? You will not reproach yourselves, he says, for it was all, ultimately, for the good. As he explains later, I know that you meant me ill, but your evil act has enabled us to reach this place, he says, and has allowed us to experience an extraordinary deliverance. Now go and bring our father close, so that we may once again be united. I must admit, I find that I am moved by this story every year. There is no ‘what if’ and there is no regret here. There is just the courage to go forward. What is particularly interesting about Joseph, however, is the fact that he does not minimize what they have done. He recognizes that this event is part of the larger narrative of his life and he gives it meaning on that basis. But at no point does he fool himself into thinking it was any less hurtful than it was. He is quite willing to engage in the full accounting of what has happened. I think that this point is key: to be able to heal and forgive, it is absolutely necessary to acknowledge openly the pain of the past. But that is why his example is so awe-inspiring; something so awful also set in motion something so extraordinary. The Israelites cross the Reed Sea on dry land after Moses lifts his hands at God’s command. After they have safely crossed, the waters fall back down again and drown the Egyptians who pursue them. On the other side of the water, they are much relieved; they sing a song of redemption: Mi chamochah. The hardest part of redemption is learning to think yourself worthy of it. Last week, in response to the portion Va’era, I raised some questions relating to God’s hardening of Pharaoh’s heart. This week, I wanted to investigate in greater depth Maimonides’ position on this issue. In Maimonides’ view, virtuous or moral behavior is established through repetition and training. Individuals are rewarded or punished not for isolated events, but rather for their pattern of behavior. Providence punishes (in the form of adverse outcomes) those who turn their attention away from God or cater to the desires of the body, particularly when they do so repeatedly. These adverse outcomes are the natural consequences of such actions. Thus, when the Bible speaks of God’s punishment, it refers to the impersonal actions of Providence. In the context of the Exodus narrative, for example, it might seem that God is actively changing Pharaoh’s heart, but the outcome should instead be understood as the natural result of the Pharaoh’s decisions. As Maimonides explains, “…Pharaoh and his followers disobeyed by choice, without force or compusion.” God does not act in the sense of causing the heart to become resistant to change; rather, the Pharaoh’s repeated refusals reinforced his resolve and led him to become increasingly resistant to Moses’ requests. Maimonides also acknowledges that there are verses in the Torah that “cause many to stumble and think that the Holy One – blessed be He! – has decreed that man shall do good or evil and that man’s heart is not allowed to do as he wishes.” In truth, however, those passages are reporting on the cumulative effect of the individual’s evil actions: Grave sins and repeated transgressions create a barrier to repentance. “Because they continued to sin,” he writes, “repentance was withheld” and they could not break the pattern of behavior. It was not God who caused their difficulties; rather, they were the ones at fault. “Consequently it can be said,” he writes, “that the Lord did not decree Pharaoh to do ill to Israel, or Sihon to sin in his country or the Canaanites to act horribly or the people of Israel to be idolatrous. All these sins were their own doing and consequently they deserved no opportunity to repent.” The magnitude and multitude of a person’s sins might prevent repentance; the pattern of behavior may have become too ingrained to renounce. Maimonides, Chapter 8 of the “Eight Chapters,” in Ethical Writings of Maimonides, p. 90. Maimondes, The Book of Knowledge, 6:1 p. 124. In Cincinnati, there is a large shopping mall with exactly one lane of traffic into the parking lot and one lane out. It can get really crazy around the Christmas buying season, in fact, and will have a line of a dozen cars waiting to exit. If that were not bad enough, a popular chain restaurant has its entrance right where the traffic backs up, so drivers often have to wait for overly-full diners with doggie bags to make their way across both lanes. So it happened that once during the holiday season, I was following a suburban as we were attempting to leave the parking lot. It stopped unexpectedly in the lane, right in front of the restaurant – as if there were no line of cars behind him! – and then two able-bodied passengers climbed into the car. Aghast, I honked at him: move it! What I could not see, however (for he was just outside of my peripheral vision), was the man in a full leg cast up to his hip making his way cautiously across the icy sidewalk to the car. In other words, the suburban actually had a good reason to stop. Um, no, not stupid, actually. Just sorry for having honked at him before I understood the situation. In the case of Pharaoh, it is not stupidity that causes him to ignore all the signs around him, but rather a refusal to understand. It’s not that he doesn’t see the man in a hip cast, but rather that he simply doesn’t care. Even so, in responding to Moses, Pharaoh certainly seems remarkably dense. Exactly how many times does Moses have to correctly predict a calamity before Pharaoh believes that Moses has God on his side? How could Pharaoh be so stubborn? The text, of course, provides its own answer: God intervenes and hardens Pharaoh’s heart. But why does God do that? We have here a basic problem of free will: if we are to be held responsible for our actions, if we have some kind of ethical responsibility, then we must assume that the actions we take are made on the basis of free will. For it would be merely cruel to punish someone for something outside of his or her control. But, if we do indeed have free will, then how can it be possible for God to harden Pharaoh’s heart? It could mean that God has the ability to intervene and cause someone to fulfill a predetermined destiny. But then we have an ethical difficulty: how do we know when God has made this predetermination, as opposed to knowing when an individual has chosen this path voluntarily? How could we hold everyone responsible if some are indeed responsible but some really are not? In this explanation, it is Pharaoh’s own doing that he has become so stubborn; God is involved only in the sense that God is involved in everything. But this explanation does not address a critical question: why is Pharaoh being so stupidly stubborn about the Hebrews? Why does he stubbornly endure (or be hardened to endure) ten plagues? In this regard, I think that Maimonides’ naturalistic explanation makes the most sense: he argues that Pharaoh’s own wickedness has become such an ingrained habit that it is nearly impossible for him to repent and change his ways. It is as if God had hardened his heart, for he is so accustomed to a certain path of behavior. Aha. There is an important insight there. Sometimes our worst behavior is the force of habit: a reflexive refusal to recognize the pain and suffering of others whenever it is inconvenient to change our ways. So, to return to my story: honking at someone is hardly a sin, and few would fault me for it. But the incident itself could be used as a metaphor: the people around us might be lumbering on with a difficulty we cannot see. They might be waiting for someone outside our field of view. On a small scale, these small interactions are not noteworthy. But be careful of the habits you create: Don’t go hardening your own heart. Boundless compassion takes effort and practice. And a bit of patience. As quoted in Nehama Leibowitz, New Studies in Shemot/Exodus, p. 151. Exodus 4:28 Moses told Aaron about all the things that YHVH had committed to him and all the signs about which He had instructed him. 29 Then Moses and Aaron went and assembled all the elders of the Israelites. It was a surprisingly large crowd. Aaron looked at Moses to see if he wanted to speak first – and then, realizing the nature of his role, stepped forward to address the elders. “—Oh yes,” one of the elders interrupted, “and tell Pharaoh that our God wants us to be freed. And Pharaoh will say, ‘who is this God that I should heed him? What is the name of this redeemer-God that you speak of, the God of your fathers?” The elder continued speaking, using a tone that might have conveyed a sense of genuine concern, but also might have been condescension – it was hard to tell. “By any chance did this god tell you his name?” he asked, waiting for an answer, with eyebrows raised. The crowd tittered in nervous anticipation. Aaron’s heart skipped a beat. Moses had been so sure of himself that Aaron had not stopped to think that it could have been a demon who sent them. The metallic taste of fear rose in his throat. Was it really God who spoke to Moses? Was it really God who noted our suffering? Does God even exist? And how could we possibly know? Exodus 4:30 And Aaron repeated all the words that YHVH had spoken to Moses, and he performed the signs in the sight of the people, 31 and the people were convinced. When they heard that YHVH had seen their plight, they bowed low in homage. You are currently browsing the Bible stories category at Godtalk.